Christopher Phillips is a man on a mission: to revive the love of questions that Socrates inspired long ago in ancient Athens. "Like a Johnny Appleseed with a master's degree, Phillips has gallivanted back and forth across America, to cafés and coffee shops, senior centers, assisted-living complexes, prisons, libraries, day-care centers, elementary and high schools, and churches, forming lasting communities of inquiry" (Utne Reader). Phillips not only presents the fundamentals of philosophical thought in this "charming, Philosophy for Dummies-type guide" (USA Today), he also recalls what led him to start his itinerant program and re-creates some of the most invigorating sessions, which come to reveal sometimes surprising, often profound reflections on the meaning of love, friendship, work, growing old, and others among Life's Big Questions. 'How to Start Your Own Socrates Café' guide included." I'm going back to monthly book discussions, which can (of course) continue past that month. I hope anybuddy who is interested will join us. This is a book discussion, not a Socrates Café that meets face to face for discussions. Maybe each of us reading together, though we live in widely scattered communities from Kansas to Georgia to Missouri, will be able to find a local group in the future. 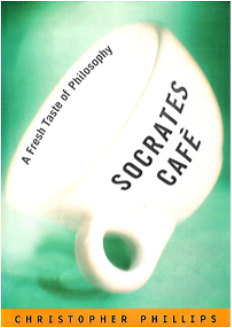 Socrates Cafés are gatherings around the world where people from different backgrounds get together and exchange thoughtful ideas and experiences while embracing the Socratic Method. March 16 ~ Chapter 1 ~ What is the question? March 23 ~ Chapter 2 ~ Where am I? March 30 ~ Chapter 3 ~ Whom do you need? April 6 ~ Chapter 4 ~ What's it all about? April 13 ~ Chapter 5 ~ Why ask why? There's a Glossary of Philosophers at the end of the book (pp. 213-224). Someone who read this library book before me noticed a couple s/he thought should have been included and jotted in "Where's Epicurus? Lucretius?" Beyond that is a section (pp. 225-229) that suggests Further Reading.